So, after I finished the boxy tunic (dress) I decided I hated the length it was at. I wore it for a day that way, but I still didn’t think I’d wear it in general. Fortunately, there was a Peter Gabriel movie. Or, to be more specific, Mr. Ink and his best buddy wanted me to go with them to a showing of a Peter Gabriel movie. One night only. The thing is, I really don’t know his music at all, and as it is with so much from the ’80s, connecting with it in 2014 just isn’t going to happen. I went because they paid my way. However, I sat through the majority of the movie eating popcorn and thinking about my boxy sweater. I realized that I could deconstruct it from the bottom up. 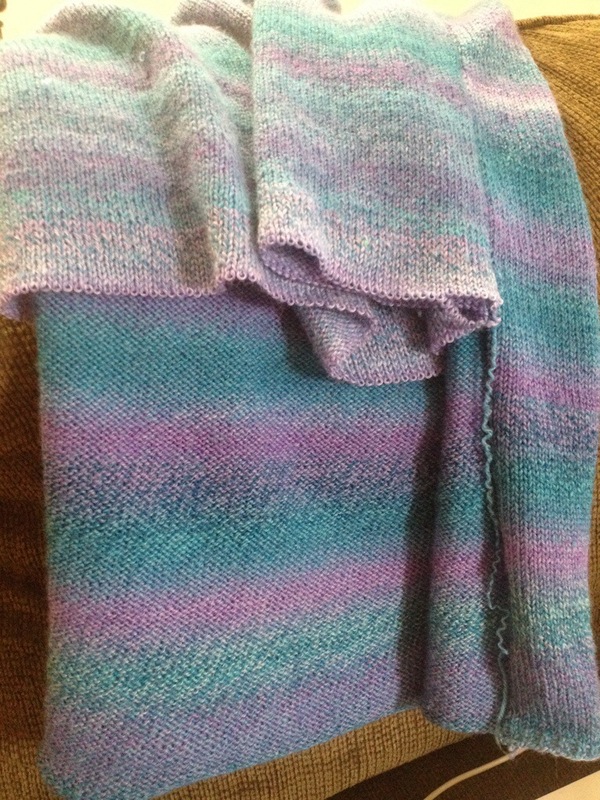 All I’d have to do is cut off the ribbing, which wasn’t laying flat anyhow, and then I could rip up the stockinette, pick up the stitches, and knit the ribbing back on. I ripped. I ripped a lot! And I reknit. I don’t yet have pictures. However, I also knit about double the amount of ribbing it requires in the hopes that it will lay flat. It is no longer a tunic, it’s a sweater. BUT…it’s a sweater I like and will wear, so that’s a win in my book. In other news, yesterday Mr. 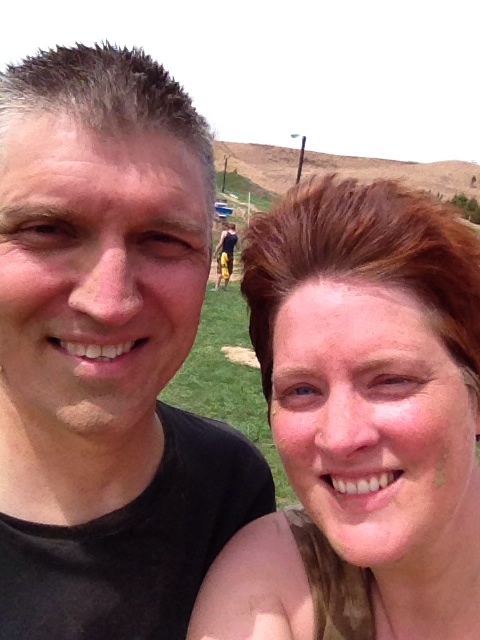 Ink and I participated in a local mud run. As it takes place at a ski hill, it was a fabulously hilly course. This was his first mud run, but my second. It was nice, this time, to have someone with me helping me with obstacles I struggled with, and to wipe the dirt out of my eyes. We had a great time, and while I said this would be my last mud run, I suspect it might be something we do together once in awhile. We had a great time. Selfie after our first attempt at cleaning up. I might add that my shirt used to be white. I got a bit burned, and of course my entire body aches today. Add to that the fact that I am coming down with the cold and cough Miss Bug has had for the past week, and it turned out that revisiting the boxy tunic was the perfect activity for today. Not to mention all the rain we had. So, Boxy pictures after the weather clears. I finally finished my Boxy tunic. At a point, I was worried it was more dress like. I worried I would run out of yarn, and I basically did seeing as I had 3 strands of yarn left at the end, none of them in useable lengths. When I tried the finished item on, I hated it. I tried belting it. It didn’t work for me. I thought it over for awhile. I figured, if I really hated the length, I could change it. 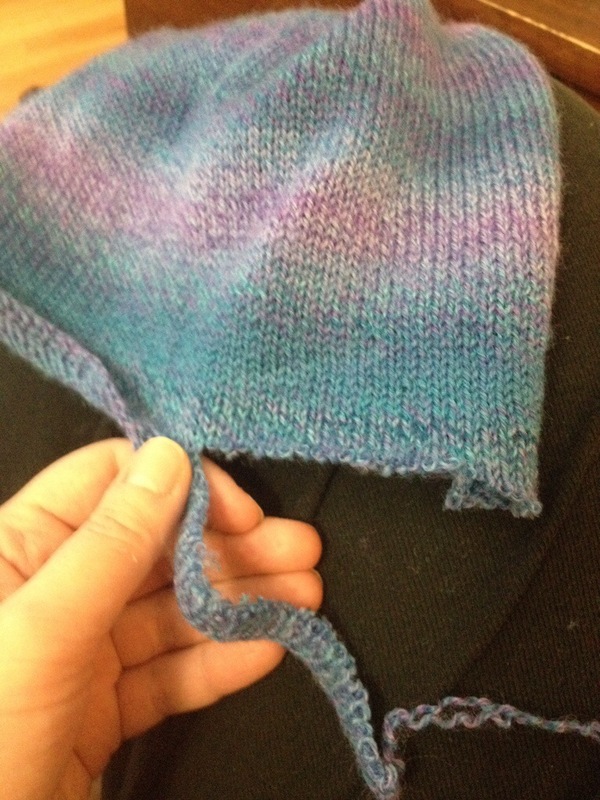 I’d take off the ribbing at the bottom, and rip up to a length I liked, then knit the ribbing back on from the bottom. It seemed like a lot of work, but perhaps less work than trying to unseam the entire thing, and remove length from the top on down. 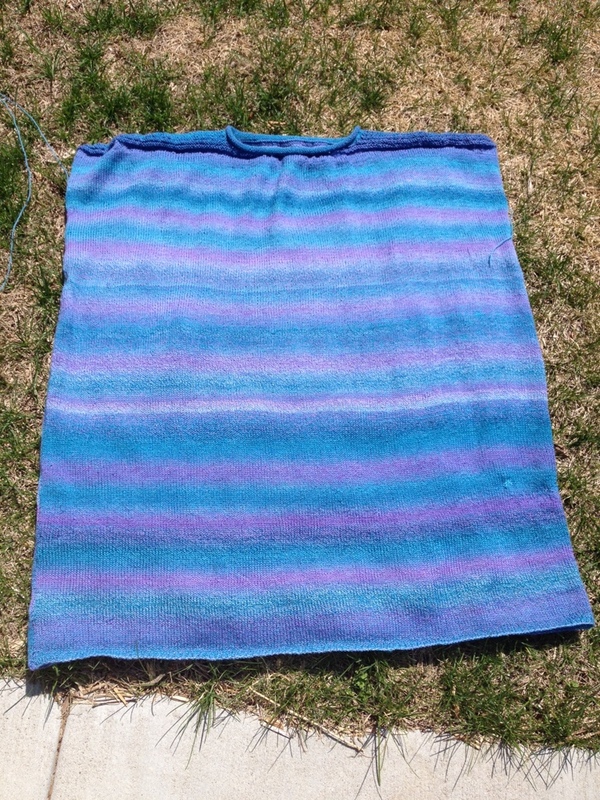 I threw it in the water for a soak. This did not help anything. An item that was at my knees upon finishing, was now lower than my knees. 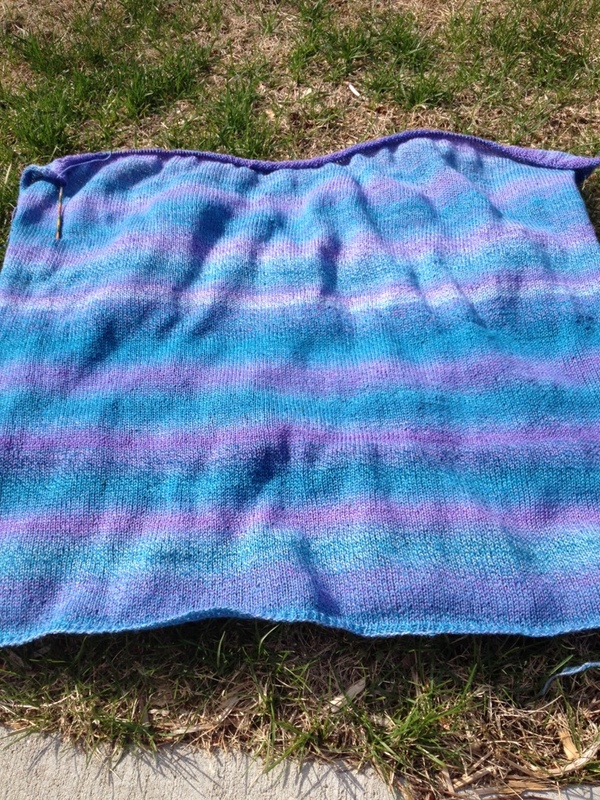 But, I figured, hey, superwash wool sometimes REALLY loves the dryer, so I threw it in there. And ended up with a length I could live with. The biggest issue now is the curling of the ribbing at the bottom, but perhaps a careful steam block will help that. I am totally wearing this tomorrow! Oh, and I already purchased my next Joji pattern, and anticipate starting it tomorrow. We’ve been hit by a fever here at Chez Shells. Miss Bug has had one for 2 days now, causing two days off of work for me. I think she’ll be ok to go back tomorrow, as her fever broke just about an hour ago. This has given me a bit of extra knitting time, however. On the first day off, I finished the front of the boxy tunic, which we should really now just call a dress, and seamed the shoulders. Today I knit the collar/neckline and seamed the sides. I also wove in almost all of the ends. Really not much. But I don’t love the idea of ordering one more skein of yarn, so this will have to do. Or I’ll make do. One of the two, and probably a little of both. Then it’s on the blocking and wearing and starting the next! This is the last of the undyed BFL wool, so I don’t know when you’ll see more dyeing from me. 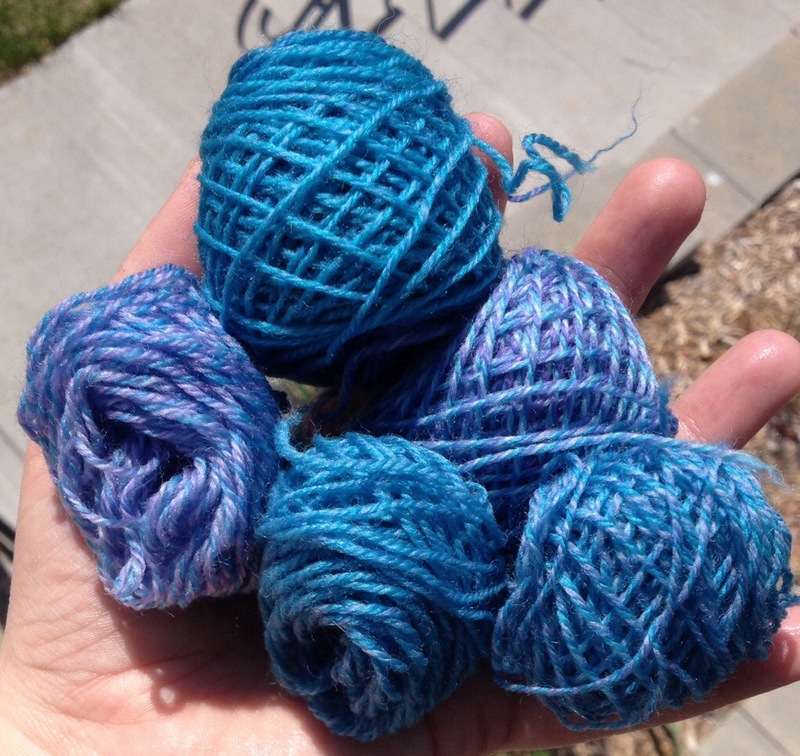 I do have another pound of merino/silk, but I’ve also got a sick kid, and I use her to help separate and then chain the 4 oz. bits for dyeing. My idea with this one was to do tones of brown. I’ve purchased fiber with tones of brown before, and always loved the result. So, I pulled out all my brown tone dyes and gave it a whirl. It was commented that the result looks like a calico cat, and I’d have to agree. 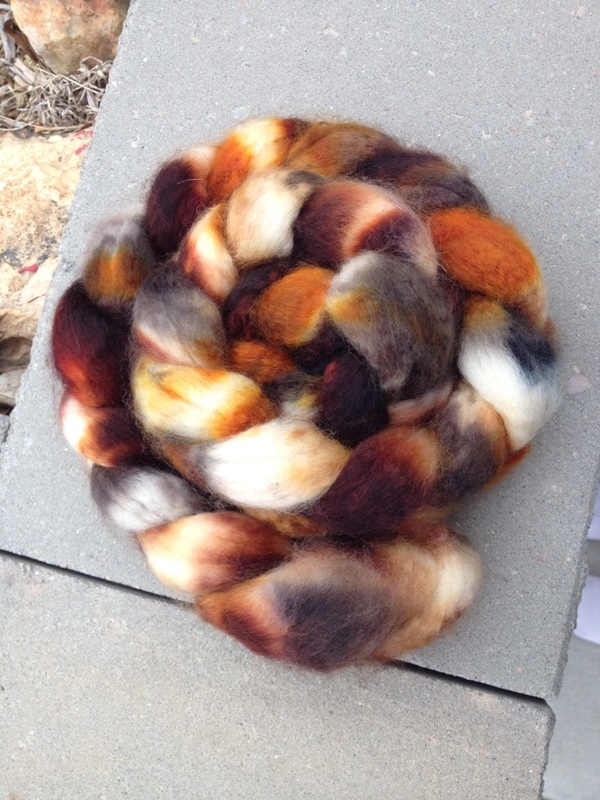 I think it is quite amazing that I’ve consistently liked the result of my dyeing lately. I’ll certainly have no business purchasing fiber in the near future! In other news, Mr. Ink (my favorite name for the man in my life) and I headed out for an overnight trip to Des Moines this weekend. He attended the Volbeat concert while I hung out with the dog at the hotel. Sunday morning we got up early, and headed out to do some biking. 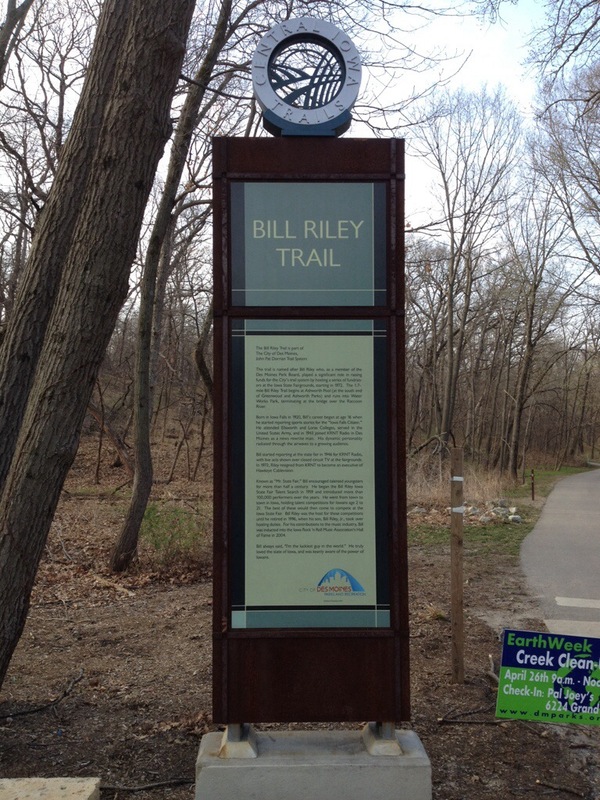 I took a few pictures of what is possibly some of the nicest signage I’ve ever seen at a trail. One I took because it is my dad’s name, which I thought really fun. In the end, we weren’t on these trails, there’s some mountain biking trails in there as well and we had fun exploring them. We hope to get back out there at some point, since I tend to be very cautious on my first run through. I’ve also been doing so much biking, that my muscles are just all exhausted, which didn’t help matters since this trail was a step up in difficulty from what I am accustomed to riding. Even so, it was a very successful little trip, and a nice way to get away and out of a routine for a bit. I’ve been knitting away on my tunic all week. I am working on the front, and have now reached 28 inches. I need to work to 37 inches before I can start the shoulder shaping. You’d think that all this stockinette would be killing me at this point, as I’ve been working on this almost exclusively for 3 weeks. But it still holds my interest even now. 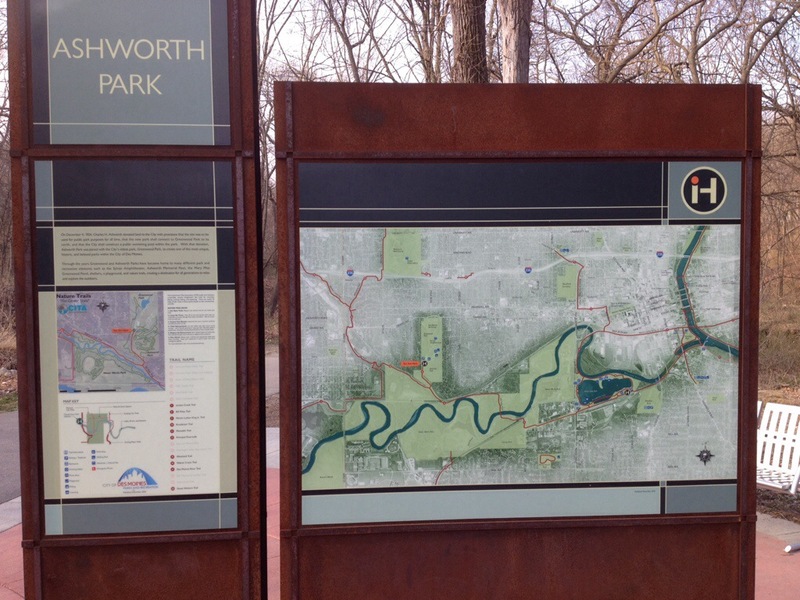 It is true that I could be farther along on this, but I’ve been doing a lot of biking. I’d venture to say almost too much biking. But, the weather is improving finally and thus my desire to bike is higher. So, I am going to push on, despite the sore muscles and lungs, and the feeling that I just can’t quite get up to the speeds I’d prefer. In the end, I’ll be stronger for it. Have a glorious weekend everyone, I hope the weather where you are is absolutely divine. 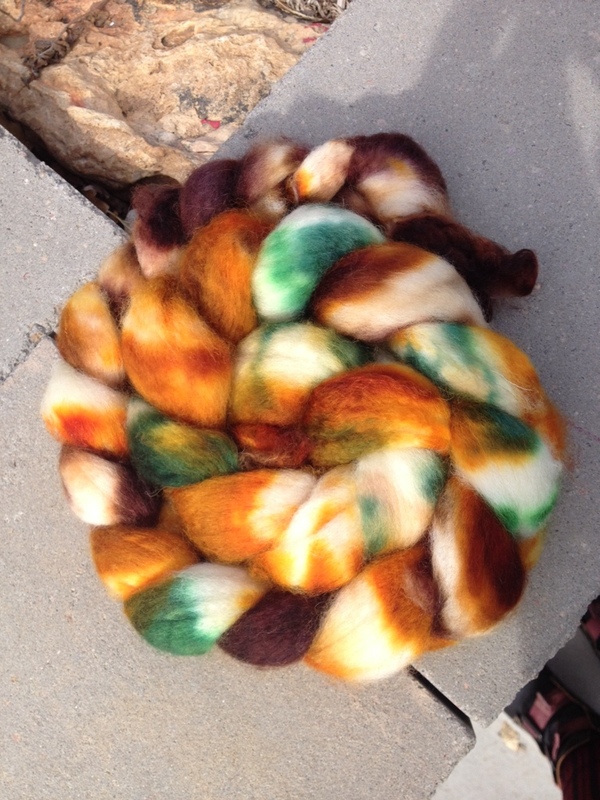 I’ve been continuing on with my dye week. I throw some fiber in the dye pot if I’ve got an evening “off.” It’s been an effective way to continue. My current method continues to work well. First up is 4 oz of BFL. I dyed this on Monday actually, but I didn’t think it had enough color, so I threw it in the dye pot again last evening and added the purple. It’s still going to be on the lighter end of the spectrum when it is done, but I like the addition of the purple quite a bit. And then I tried another. This one turned out far better than I could even imagine. I absolutely LOVE it. All the colors here, and the combination of them, totally trip my trigger. Plus, perfecting my method has added to my happiness with the fiber overall. I plan to continue this trend since it seems to be working so well. And I keep having ideas. So, that’s refreshing! 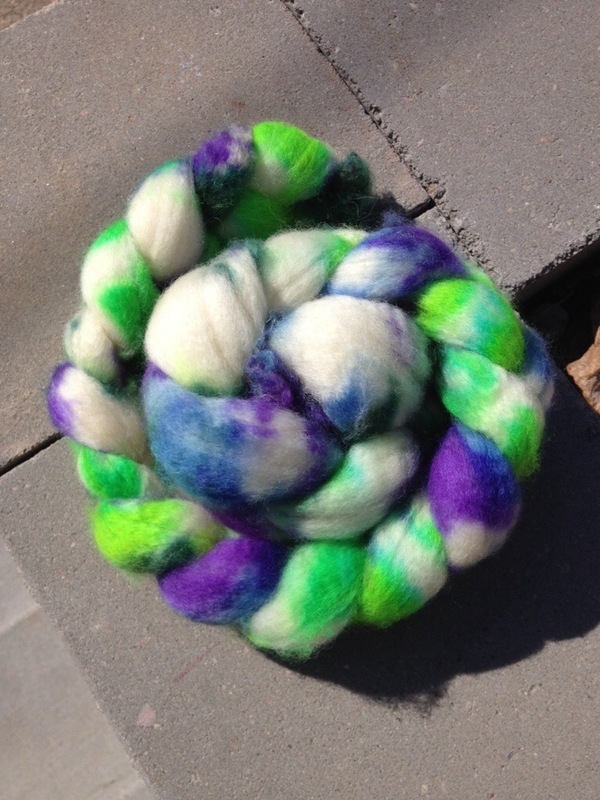 Having realized I had more fiber than I thought, dye day continued. 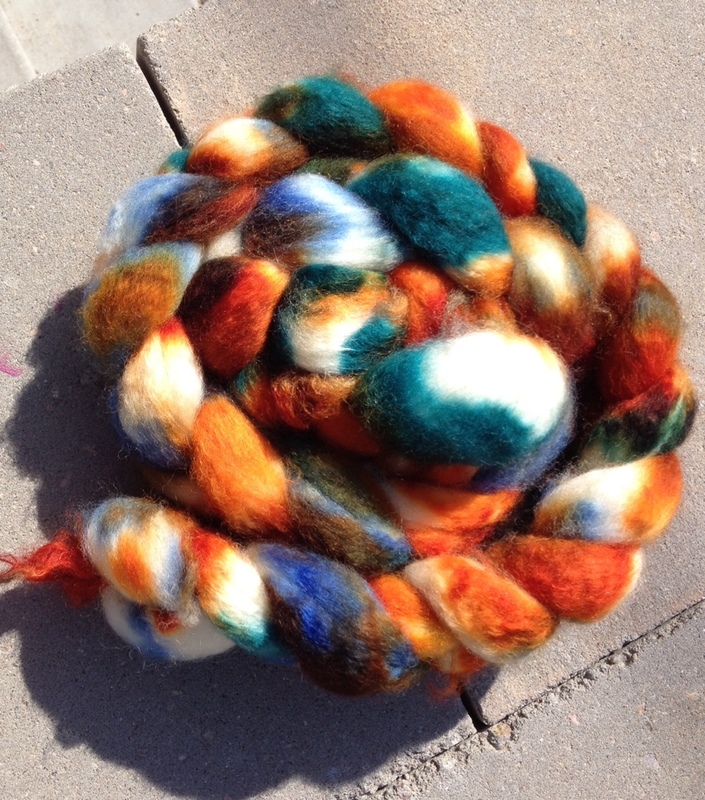 On Monday evening, I dyed two braids of BFL wool. One does not please me yet, it needs an additional color. So back in the dye pot it goes tonight. However, the other turned out fabulous. It is truly something I would purchase for myself given the opportunity. 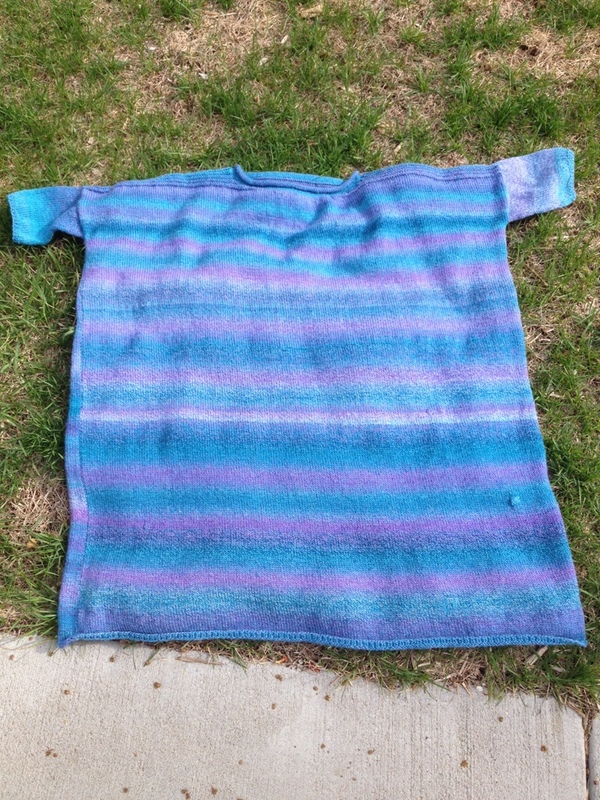 I am not sure what else to say about this, except that I’ve finally found a wool dyeing method that seems to work for me. I think I can continue to tweak it, but I am overall happy with it and appreciate the results. I’ll keep going now, and see what else I can come up with.